In 2008, a Green New Deal was adopted by the United Nations Environment Program and the German Green Party. The Green New Deal was a central part of the platform of Green Party presidential candidate Jill Stein in 2012 and 2016. 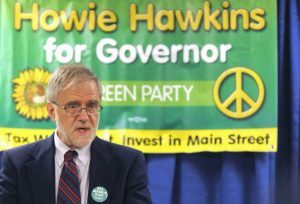 Howie Hawkins, the Green Party candidate for governor of New York in 2014 and 2018 did the same. In a previous interview with Gotham Gazette, three-time Green Party gubernatorial candidate Howie Hawkins -- who has been running on a Green New Deal for New York since the 2010 race -- suggested that it would take “a World War II-scale mobilization” to prevent catastrophic damage from climate change. “During World War II we nationalized 25 percent of manufacturing in this country to make sure we could turn on a dime to make the weapons we used to beat the Nazis. The private investor-owned utilities and energy companies, they haven't led the way to clean energy, so we may need more public ownership,” Hawkins suggested. This article originally appeared in International Socialist Review, No. 115, Winter 2017-2018.